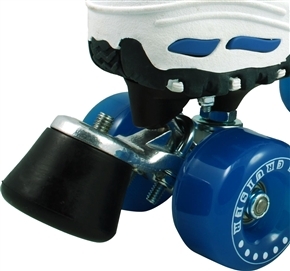 Looking to mount a rear brake on my dedicated outdoor skates. I see a few options, but am concerned about clearance. Since I have a very forward mount, I want the stopper as far from the ground as possible (only to be used in emergencies). Which of these would have the most ground clearance? Last edited by Gle8; January 10th, 2016 at 06:20 PM. Ground clearance for rear brakes should be evaluated based on both height clearance and tilt angle clearance. Plates with steeper kingpins will send the brake to angle closer to the ground. The 3rd one low height clearance and limited angle clearance too. Plus it has a rather thin wear pad, though the wear contact area should quickly grow much larger than the 1st two, which should help extend life, despite its thinness. Most protrusion rearward it seems too.